Within the Trochilidae (Hummingbird Family), there are 339 species and 116 genera. (NOTE: "Genera" is the plural of "genus"; the word "species" is both singular and plural.) Hummingbirds occur ONLY in the Western Hemisphere, with almost half the species (163) living in the "equatorial belt" between 10 degrees north and south of the equator. 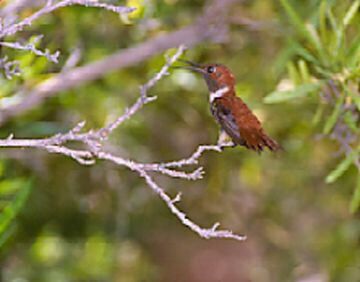 Within the continental United States, there are 16 species of breeding hummingbirds, with another half-dozen or so Mexican or Caribbean species that have been spotted in the U.S. There are no hummingbirds in Hawaii, of course, but four--perhaps five--species have been reported from Alaska. Photo © Bill Hilton Jr.
panting in the heat of the Arizona desert. Not all hummingbirds have the word "hummingbird" in their names; there are sabrewings, jacobins, woodnymphs, and many others with poetic or historical epithets. Some hummers are named for a dominant color, as in Ruby-throated Hummingbird, Black-chinned Hummingbird, or Green-breasted Mango. The Bee Hummingbird is the tiniest of all birds and among the smallest of warm-blooded vertebrates; an adult male weighs about 1.95g--less than the weight of two paper clips!--and its nest is only 3cm across. By comparison, a typical adult female Ruby-throated Hummingbird weighs 3-5g and her nest is twice as broad as that of the Bee Hummingbird.